Celebrity Cruises reveals what it means to work remotely with the launch of the Meeting Place – a state-of-the-art meeting venue onboard the heralded Celebrity Edge. Designed by Wilson Butler Architects, the 1,970 sq ft venue commands a central location on the ship, complemented by brilliant, awe-inspiring views like no other meeting space on land or at sea – perfect for any need. With soundproof dividers, advanced audio-visual capabilities, varied seating options, private office space for event planners, dynamic mobile bars set up for food and beverages, and a fully equipped pantry with a bar, the possibilities for this venue are bewildering. The word that defines the Meeting Place is ‘connected’. It facilitates guests getting connected to one another; to the latest technology and to the greatest new ideas. It also happens to connect to other venues on the ship that vastly expand the opportunities for groups. Seating is modern and comfortable: Choose theatre-style, classroom, U-shaped, or circular layouts, while table tops work well with or without covers or skirts. The space transforms seamlessly from day into night, with high-top bar tables or comfortable lounge seating for mixing and mingling. It wouldn’t be Celebrity Edge without innovative technology at guests’ fingertips. Audio-visual systems – from wireless microphones to a mini sound board – come as standard equipment. An electronic whiteboard helps capture brainstorming sessions easily, while the impressive 98-inch and 75-inch LED screens add a powerful punch to business meetings and a subtle mood for social occasions. 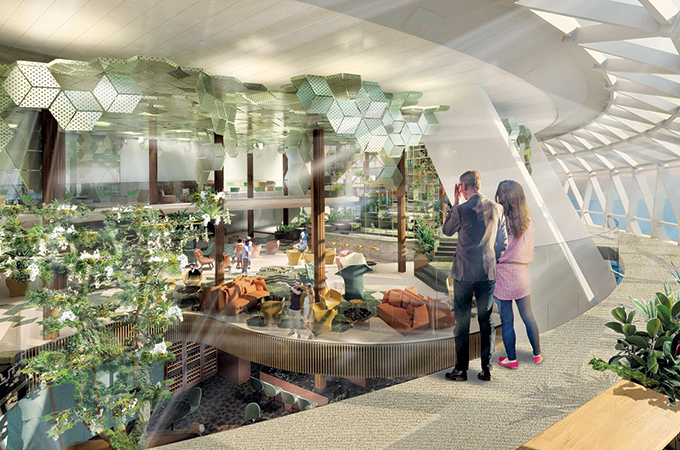 Previously unveiled venues on Celebrity Edge are also available for private events and meetings based on availability, including the three-deck spanning Eden; the revolutionary, cantilevered Magic Carpet; the serene Rooftop Garden; and the tech-savvy Destination Gateway. Each venue is offers extensive audio-visual capabilities, unrivalled, expansive views, and a one-of-a-kind experience.